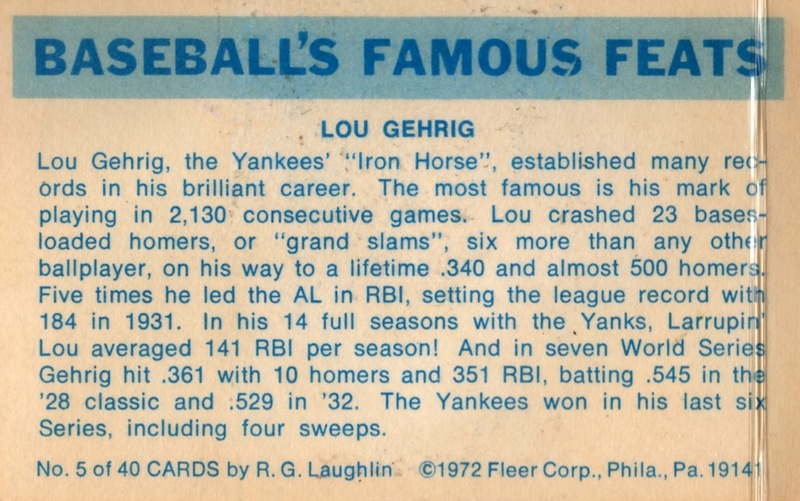 Artist Bob Laughlin self-published a Great Feats of Baseball set in 1972, after an agreement with Fleer fell through due to Topps own 1971 highlight set. (Catch those details in my Great Feats #5 profile.) They thought better of things a year later and reused many of Laughlin's pictures--now colorized--as the 40-card Baseball's Famous Feats. 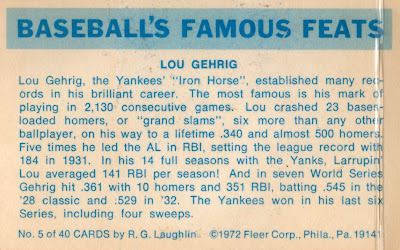 Fleer owned an official MLB license--prominently featured above--but they left out any living players to avoid paying royalties. That also meant a shorter checklist than Great Feats, with no Koufax, Mantle, or DiMaggio. 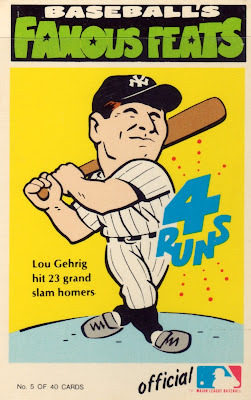 Some 70 years after his untimely death, Gehrig remains the all-time leader in grand slams, with Manny Ramirez (21) and Alex Rodriguez (18) his closest active competition. One lucky year could include 3 such homers, so both have decent chances to pass Larrupin' Lou. Fakes / reprints: This set's sort of a reprint, but I haven't seen any fakes in the market. I have several of these still from when I was a kid. Wouldn't mind finding a good home for them.